She-Ra and the Princesses of Power: A New Beacon of positive representation? She-Ra – the new and improved version? Netflix and Dreamworks have once again teamed up to deliver a reboot of toy-bait eighties kids show – this time He-Man’s little sister – though in the reboot, She-Ra, aka Adora stands on her own. And of course, because the show’s name and voice cast is about 80% female, and those characters actually have varied and realistic body types, dude bro geek boys are crying foul and claiming that the show is ruining She-Ra. Let’s look at that for a moment shall we? For one, you are not the intended audience – both the original She-Ra and the new reboot are aimed at young girls. Your views on ‘how bangable the characters are’ are irrelevant. Second, have you actually watched the original cartoon? It’s so so bad, and the female characters are all essentially palette swaps of She-Ra. And let’s be real, the animation and voice acting is also kind of laughably terrible. So, now I have my venting at the idiots out of the way, is it actually any good? The answer to that question is yes. OK, it’s a little repetitive and formulaic, but again, kids show. 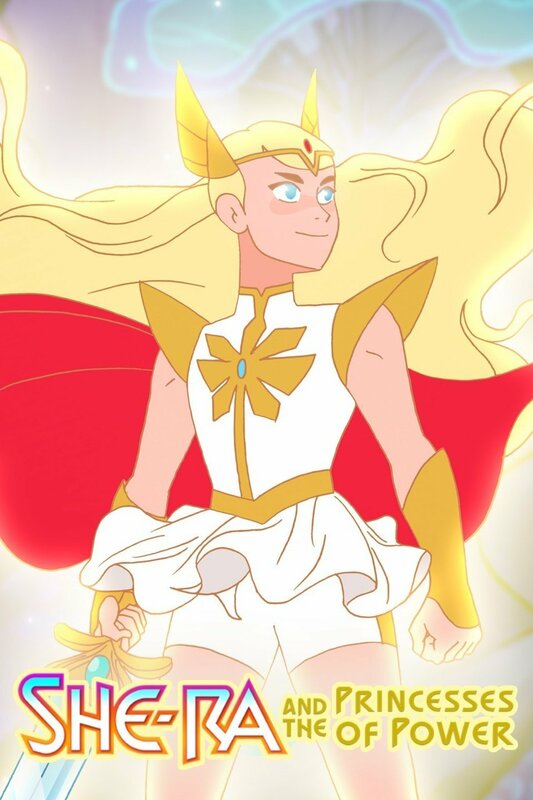 The art style is really nice, reminiscent of 90s magical girl anime, and if you think about it, She-Ra is basically a magical girl. Noelle Stevenson (Nimona, Lumberjanes) has done a great job. The world looks visually gorgeous as well, and the world building is a neat twist. The voice acting is excellent, and it was really nice to see AJ Michalka (Stevonnie, Steven Universe) get a bigger role. The new She-Ra also shows up Voltron in one huge way. Dreamwork’s hugely popular (and occasionally toxic) early series claimed that they had to fight to get what little queer content they could into Voltron, after the controversy surrounding the inclusion of a new character. And while Voltron only managed this small inclusion after seven seasons of fans asking for queer content, She-Ra managed to include multiple queer couples, (including a nod to Stevenson and her fiancée) and magical rainbows may form a crucial plot point. And that’s not even getting into the dynamic between Adora and her best friend-turned-nemesis Catra. And yes, Voltron may have paved the way for She-Ra executives, especially when you consider the backlash in fan communities. But it does make you wonder how hard the Voltron team really fought. Of course, this is the thing – hire queer creators, and diversity increases. Rebecca Sugar, creator of Steven Universe came out in July 2018 as non-binary – just like the Gems. Noelle Stevenson is engaged to a woman – and creates wlw couples in her work. I do have one worry going forward though. Fans are already criticising the show for supposedly following the “white saviour trope”, which I’d argue is debatable. I just hope that it doesn’t go the same way as the criticism of Voltron and Steven Universe, and end up being seriously toxic. After all, the show is supposed to be about empowerment and teamwork, not dragging people down.